Just saw it drop from Vigilant Kuro on a stream. Just got one as a drop from Vigilant Kuro. I wouldn't be shocked if it could drop from Vigilant Thanos too, based on flavor text / effect, and the fact that multiple sources could explain why it's listed as a generic "Drop: Argus". 100 kills and no drop for me... last collectable I need from Argus. Got this toy after about 30 attempts. I pretty much parked alts by Vigilant Thanos and when the world quest for him was up, I logged in and killed him. You don't need to have world quests available in argus on your alts. Simply killing the boss can give you the toy. It seems that the barrier is able to deflect certain other throwable toys, returning to sender giving them a minute long, dismissable stun: Holy Retribution! Tested with a few toys, and can confirm that it deflects the following: Dalaran Disc, Foot Ball, Holy Lightsphere, probably others too! Killing Vigilant Kuro and Vigilant Thanos on 12 charcters. EDIT: Welp, looks like whining about it worked for once. Dropped on my 236th attempt. I got this toy on my first try and didn't even realize it was that rare. Damn. I wasn't even trying to get it or know the mob dropped it when it did, perhaps just blind luck on my part. Barrier Generator: Found after 8 attempts! Wanted to point out that the reset for loot from these two NPC's resets at 7am PST time. Its not based on when the world quest starts and stops. The world quest is long enough in time that you are able to kill the NPC's twice for loot. Also keep in mind that you do not need to even have Argus unlocked to get loot from the rare NPC. Easiest way I found is to use Wormhole Generator Argus on a Legion level 1 engineer until I ended up on Mac'Aree. Than I used a warlock to summon my other characters their easily. 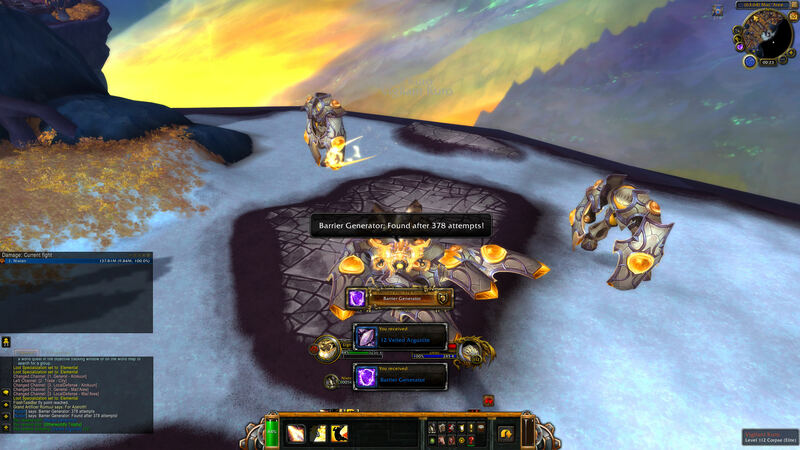 I'm not sure of the current specifics on tagging and loot drops, however a level 85 stealthed druid I used for summoning was able to receive loot after Thanos died by my level 120 in the same party without needing to tag the mob. Took about 50 or so character tries before it dropped for me. Barrier Generator does not work on any types of paper airplanes . "The crystalline technology used to create these barriers is still not well understood."